Once a chief in a small village in Ghana told a servant to go to the market. "Bring me the best pece of meat that is sold in the market," said the chief. The servant obeyed and ran to the market right away. The chief was surprised when the servant came back with the tongue of a large cow that had just been butchered. It did not look like it would be good to eat. Yet when prepared by the cooks, the chief was impressed. The meat was truly delicious. It was tender and savory and quite pleasing to eat. The chief called the servant to him again. "The tongue was truly wonderful. 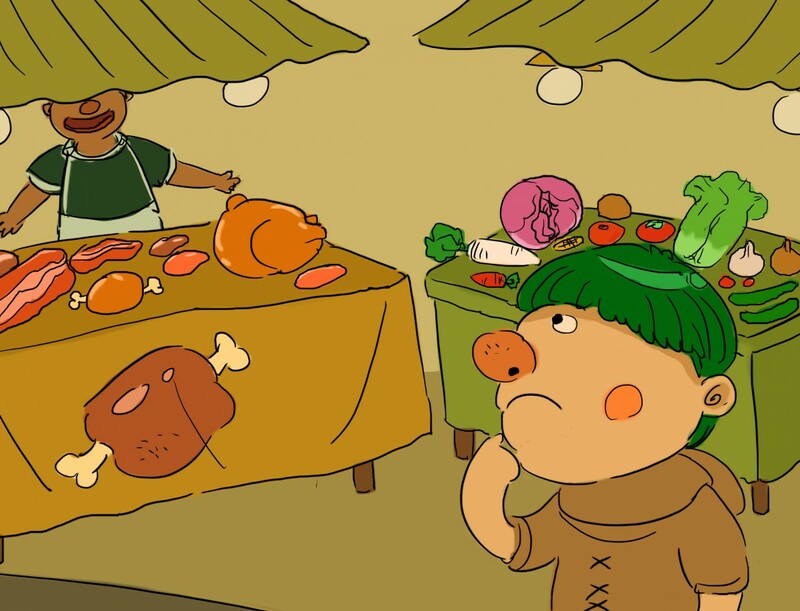 Now go to the market again and bring me the worst piece of meat that is sold in the market." The servant obeyed once again. He ran right to the market. Soon he came back carrying a piece of meat that looked like the first. The chief was surprised that the servant once again brought him a tongue from another cow that had just been butchered. "What is this?" asked the chief. When I asked you to bring me the best piece of meat, you brought me the tongue. When I asked for the worst piece of meat you brought me another tongue. Do you play games with me?" The servant answered, "The tongue can be beautiful or ugly. It can be sweet or bitter. It depends on the words and sounds that are heard by the listener. If a person's words are kind and sweet, the tongue is at its best. It is delicious to the ear. The sounds of the tongue bring happiness. If the words we say are crude and sharp, they can be hurtful and bitter. They can bring sadness and pain." "Thank you," said the chief. "Your words are wise." Then to his people he said, "May the words of all of us be sweet and delicious for all who hear them."